SALES! SALES! 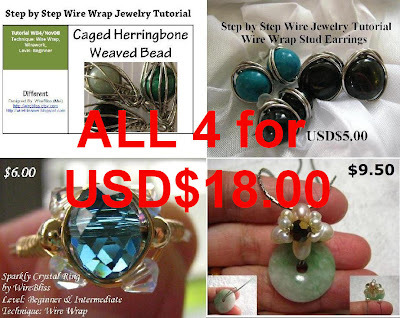 Now you can purchase ALL 4 Tutorials for ONLY USD$18.00. Its Christmas time and what better time to create your own jewelry and gifts. You saved USD$7.50 (to be exact) or almost 30% off. To purchase, head on to my ETSY SHOP - WireBliss.etsy.com or click on the PayPal Buy Now button below. All tutorials are in full color electronic PDF printable file format. My contact email address and website in case you run into questions while creating the pieces.